I had the unique privilege to see filmmaker Daniel Barnz's Phoebe in Wonderland three times over the course of a year in three very different formats. My journey through the rabbit hole with the film began last June via a screener from ThinkFilm as I wrote the synopsis for its inclusion as an opening night selection for the Scottsdale International Film Festival, followed by experiencing it on the big screen when it was screened to kick off the fest, and now in its DVD debut from Image Entertainment. Finally released theatrically in major markets this Spring-- the overlooked gem that seemed to be a casualty of the uncertain future of ThinkFilm and several small studios-- garnered a great word-of-mouth campaign and critical acclaim from everyone including Leonard Maltin to Peter Travers, even going so far as to received Heartland's Truly Moving Picture Award. Now in tandem with other studios and production companies including Lifetime Pictures, which I'm hoping will guarantee that the film will screen on the channel and be made available to more audiences in the future, the DVD has arrived (serving as my own personal Film Intuition pick of the week) and the transfer is visually stunning. Presented in the original widescreen aspect ratio-- the menu alone sets up the magic to come by filling the top and bottom black bars with what appears to be a sparkling starry background as the wondrous "Alice in Wonderland" character filled imagery fills the center of the screen. Sadly missing any special features aside from the original theatrical trailer and the opening previews for The Ramen Girl and Lost in Austen-- the presentation on DVD (in what I ascertained from online retailers gives viewers the option of purchasing it in two different styles of cover packaging) is excellent as the colors pop even brighter than in the print I saw in the theatre on my upconvert Blu-ray player. 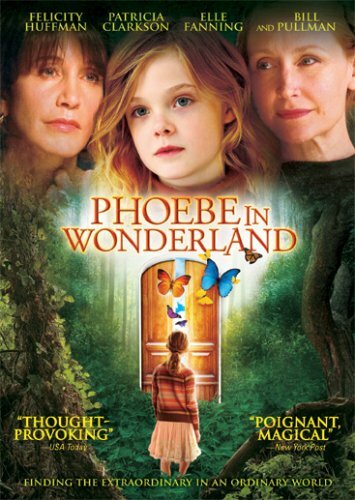 While I definitely urge you to go on the hunt for Phoebe, parents will want to be sure to preview the PG-13 emotionally intense work which may bother some young children before bringing it home for family viewing. 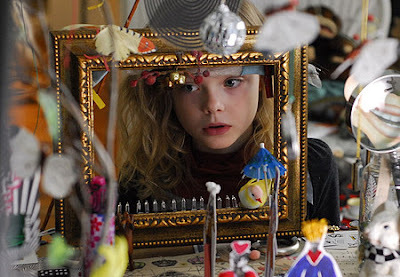 Devotees of Lewis Carroll’s beloved children’s classic “Alice in Wonderland” series will be sure to seek out tickets to writer/director Daniel Barnz’s cinematically dazzling tea party which draws numerous parallels to Carroll’s work. In fact, there's so many parallels that I found myself picking up more the third time around as I realized that there's an opposite or backwards world, dialogue that sounds like that of Carroll, etc. 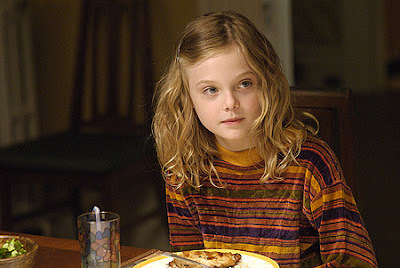 At a crossroads between acceptable childhood innocent curiosity and imaginative exploration mixed with peculiar Alice-like behavior, we follow the tale of the sensitive nine year old Phoebe (Dakota's talented younger sister Elle Fanning), as her tendency to live in her creative mind is beginning to baffle her classmates, teachers, and parents (Bill Pullman and Felicity Huffman). 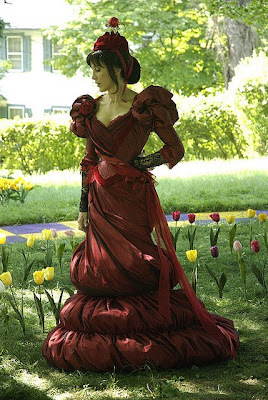 When she’s given the lead role in the school’s theatrical production of “Alice in Wonderland” by her unorthodox new drama teacher Ms. Dodger (Patricia Clarkson) who likens herself to the Mad Hatter, Phoebe becomes increasingly drawn in by the play, which is coincidentally the same topic of her mother’s scholarly dissertation turned nonfiction work. 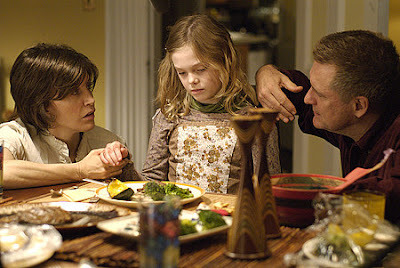 Mistaking her daughter’s erratic mannerisms as a cry for motherly attention, Hilary Lichten (Felicity Huffman) tries to intervene when Phoebe runs into trouble with her strict principal (Campbell Scott), however when it becomes apparent that Phoebe is going through something more than just a fleeting fascination with Alice’s “looking glass,” those around her realize they need to stop listening to themselves and start listening to Phoebe. Tenderly drawn, heartfelt, and filled with gripping portrayals from its ensemble cast, Barnz’s Wonderland was screened in a highly successful premiere at the Sundance Film Festival before it was singled out by several critics as one of the festival’s hidden gems. 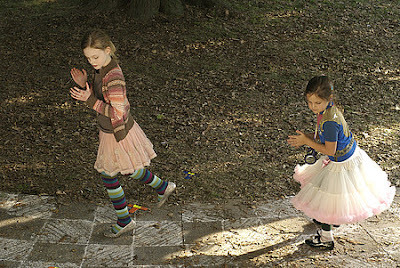 And although it's taken a long journey to arrive on DVD-- seemingly falling down the rabbit hole in its trip that lasted more than a year-- it's of particular interest to not just fans of "Alice" but also those looking for brainy, psychologically rich independent films headed up by strong female cast mates with particularly deft turns by Fanning, Clarkson, and Huffman.